TESTHEAD: Well, How Did I Get Here?! It may be a little annoying to some for me to talk about the year that is 2010, and I know that lots of people do this with lots of different things, but really and truly, 2010 has been a banner year for me as a software tester. So much has happened, so many good things, so many great people I've had the chance to meet and interact with, that I just had that Talking Heads moment where David Byrne sings "and you may ask yourself, well, how did I get here?!" Have a walk with me back to the end of 2009, because it's important for context. For many years, I had been working as a software tester, mostly in the capacity of an "Army of One", the Lone Tester, the Omega Tester, fill in the blank. I joked that I could be the junior tester, the senior tester, the QA manager, the director of QA, etc. and it wouldn't really matter. I reported to the VP of Engineering and, well, I was my own department, beholden to nobody but the VP and myself. In some ways, this is good, but in others, it's bad, because there's no one there to really challenge you to do more, to be more, to go farther and learn more. At the end of 2009, I decided that I wanted to do something different. I wanted to fall in love with testing again. I remember a comment from a seminar with Steven Covey where he was describing that one of his friends felt he was in a dead-end relationship with his wife, that the spark was just gone. Covey's response? "Then love her". The guy protested and said that it's not that easy, it just felt so dull and tired, and again, Covey replied "Love her"! He then went on to explain that love is an action, it's something you do, not something you feel. If you want to rekindle that spark, then do things that will cause the spark to reappear. Standing around waiting for it does nothing! What was the last testing book I read? I only had one, Testing Computer Software, and it had been years since I read it in a meaningful way. Hmmm. When was the last time I attended a training related to testing? 2007, when I went to a Training seminar provided by AutomatedQA. Before that, I had to go clear back to 2001, when I had the chance to do a test training for Windows XP up at Microsoft! When was the last time I interacted with other testers? Hah, what other testers? I'm an Army of One! Well, outside of work. Oh, yeah, that... ummm... never?! Wow, I was in a lot worse shape than I thought! No wonder I felt my resolve flagging; I was doing absolutely nothing to nourish the relationship. I was just showing up and doing what I felt I had to do. With this, I decided it was time to do something about it, and what better way than to do some searching for some of that old spark. From here I don't remember how exactly I came across it, but a book landed in my hands, and it was "Secrets of a Buccaneer Scholar". For those in the testing community, James Bach is a well known figure and little needs to be said, but other than from posts on his blog, I didn't know his full story. Needless to say, this book hit me like a lightning bolt. I recognized myself in these pages in so many ways, and it gave me a desire to go back and learn about testing again, but this time, learn about it on my own terms and do so with others. In February of 2010, while I was going through and looking at testing books, testing blogs, listening to testing podcasts and other things that were helping to fire my imagination, I heard Dave Ramsey talking to a caller on his podcast and he recommended a book by Seth Godin that was just being published called "Linchpin". This book intrigued me, so I decided for fun to download it as an audio book from Audible. Folks, Godin's book are fun to read, but for some reason, I like listening to Godin better. He hit me squarely between the eyes with a section about not having a resume. What? how can you get a job without a resume? By having others come to you, that's how! Have a letter of recommendation from three to five of the best thought leaders in your field. Have a product that people can touch, interact with and offer their comments about from anywhere. Have a blog so compelling that they can't help but take notice. "Yeah, but I don't have any of those things." "Yeah, that's my point! If you don't have any of those things, what makes you think you are special, talented or noteworthy?" Total skyrocket explosion moment for me there. It was those words that made me decide on March 10, 2010, that I was going to, at the very least, try one of those ideas, and with that, TESTHEAD was born. 1. I started writing regularly about my testing ups and downs, and what I had and hadn't learned over the years. Twitter and Facebook would receive somewhat regular updates on what I was posting and when I published updates. Twitter took this in stride. Many of my Facebook friends wondered what the heck I was doing (to later prompt my adding a "Geek Content Alert (GCA)" so as to not confuse and scare non-technical locals ;) ). 2. I received encouragement and ideas from Matt Heusser due to replying to one of his blog entries on writing. 3. Through searches, I came across the phrase "Miagi-Do" (really, I had no idea how fateful that phrase would be (LOL!) ). 4. Through conversations with Miagi-Do affiliated testers, I met Markus Gaertner, who ran me through my first testing challenge, helped me see some areas where I needed some improvement (and some areas where I needed serious improvement (LOL!) ) and accepted me as a student in Miagi-Do. 5. 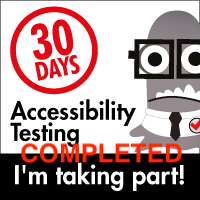 I took the opportunity to get involved in a number of challenges presented, including putting myself out on Twitter and letting people know about my blog, my involvement in Miagi-Do, and other areas where I was interested in learning more about testing. 6. Through this, I learned about the Association for Software Testing and their Black Box Software Testing classes. I figured, well, why not, they come highly recommended by the testers that I know and trust, let's give it a shot. 7. I completed the Foundations class (Whew! Not a particularly easy class, and there were a few places where I actively questioned "wait, is that right?!" and had the chance to actively debate the answers). Wow, was that fun! 8. Shortly after completing the class, I was asked by AST if I'd be willing to help teach future classes. I said "absolutely" and with no break, I jumped into the next class as an assistant instructor (and dare I say it, I learned more the second time than I did the first). 9. About this time Matt Heusser sent out a call for people to help review an upcoming book on "How to Decrease the Cost of Software Testing" and included me in the list of reviewers as part of my involvement with Miagi-Do. It was at this time, and because of a number of testing challenges and discussions I'd actively participated in, I was promoted to the rank of brown belt in the Miagi-Do School of Software Testing. 10. Additional requests to help facilitate the AST BBST Foundations class came, and I went for my 3rd session (2nd as a Staffer) and I learned more about the class and material this third time through than I did the previous two times! 11. In late July, Matt Heusser sent out a call to arms asking if there was anyone willing to help him with the podcast he was producing. As a long time podcast fan, former musician and music producer, and general nerd when it comes to audio production, I asked if I could help out. With that, I started producing the TWiST podcasts, and have been doing so along with Thomas Ponnet and Farid Vaswani ever since. 12. On August 7th I participated in my first ever European Weekend Testers event, and enjoyed it immensely. Pondered to myself "now why isn't there anything like this in the States?" Some are going to laugh at this because these words would sort of come back to haunt me later. 13. In August, an author dropped out of the Cost of Testing book project, and Matt announced that there was an opening for a chapter contributor. With that, I jumped in and submitted a chapter idea based on the idea of Trading Money for Time. It was accepted, and then a couple months back and forth to revise and review the content allowed it to pass final submission and make it into the book. 14. In October, based on many hours of updating and creating changes for the Pacific Northwest Software Quality Conference web site, I was given complementary admission so that I could attend and participate in the conference. I brought along a DAT recorder and microphone just in case some interesting conversations happened. In truth, there were several, and thus the TWiST-Plus format was created to allow us to create smaller and more compact podcasts from the regular TWiST version. 15. In November I made a comment in one of my blog posts that I lamented the fact that Weekend Testing was happening in India, Australia & New Zealand, and in Europe, but that there was no chapter in the Americas. Joe Strazzere commented back that maybe it was because no one felt it was worth the time to do it.. including me, since I also hadn't done anything to make it happen. I realized he was right, and if it were to happen, then I'd need to sit down and really see if I was one who could/would help bring it to the States. After sitting in with the European Weekend Testers group and facilitating the discussion, many of them decided "yeah, Michael, you can do this!" and with that Joe Harter, Lynn McKee and I set out on a grand adventure to found Weekend Testing in the Americas. We ran our first session on November 14, 2010. 16. An old friend and former colleague reached out to me and said "Hey Michael, you seem to know a lot about testing, would you be willing to talk a bit with me so that I can understand better what to look for in software testers were we to interview them?" After sending a few of my ideas to him, he asked if I'd be willing to meet with the founder of his company to continue the conversation. Following on from there I was asked to talk with some core people at their company, and following that, I was asked if I'd like to come and help their company build their test team, to which I replied "yes!" :). That's a long list of stuff to have happen in a single year! All I can say is that it was a tremendously busy year where I learned a great deal more than I anticipated I would, had the opportunity to do way more than I thought I could, and I had the chance to see a little blog I started as an experiment become something people all over the world turn to regularly. That is both gratifying and at the same time, very humbling. The biggest take away from all this, though, is that I found my lost love... my love of testing! There was no secret formula, there was no special gimmick, just a lot of hard work and challenges that I threw myself into and met. To that end, I have a lot of people this year to thank, including David Ziegler, Matt Heusser, Markus Gaertner, Ajay Balamurugadas, Cem Kaner, Becky Fiedler, Selena Delesie, Anne-Marie Charrett, James Bach, Jon Bach, Joe Strazzere, Lynn McKee, Joe Harter, Thomas Ponnet, Farid Vaswani, Bill Gilmore, and Rhea Stadick. Each of you helped in a big way in my rekindling my love affair with testing, and encouraging me to reach for the passion I already had for it and "work it" so that it was a bright and burning flame. 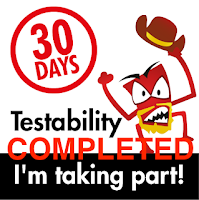 Testing is fun again, testing is great again, testing is really important to me again, and I'm passionate again about being part of the broader community of testers and helping to spread the word about it to those who would have ears to hear (LOL!). To all those that had a small or large part in making that happen, I'm grateful. Thanks for what has honestly been, at least as far as software testing is concerned, my greatest year! Here's to an every bit as exciting and fun-filled 2011. I love this post. I am going through the same things. In mid summer I realized I was out of love and started reading on how to rekindle it. I am probably in step 1 or 2 but atleast I am there and reading this makes me believe I have a long journey here that I am looking forward to. Thanks for sharing this. Its nice to know I am not alone. Forgot to add congrats ... for all your achievements. it is really great post! It is hard to imagine how much has happened in your testing life. I am also happy that you joined BBST class and provide such valuable help to students. Yo Yo Yo, Way to go! This post is not just a good first-person account of self-education in testing, it is a *blueprint* for heeding a call to craftsmanship and portfolio-building. If there is an antidote for the scourge of testers being seen as interchangable, replaceable commodities, this post is it. It is not just for testers, but veteran speakers and consultants who we see at conferences -- the ones who make us wonder, "when is the last time you did any real testing?" To them I say, you don't have to hide behind the same old material any more. Read this blog and take some of these ideas, but in one year from now, tell us how you fell in love again. This post gets my vote for best testing blog entry of 2010 (sorry, Ajay) for the honest, insightful way it will inspire people in our profession to be more honest and insightful in 2011. Very inspiring post. Most importantly it made me think about a number of things I need to review during the coming year. I had seen some of your tweets, but I hadn't actually heard your reputation until I was in the Bay Area and a fellow tester said "Do you know Michael Larsen? He's a super-passionate tester, you have to meet him." I guess something is working for you. Welcome to the Vanguard of the future of testing. I recognize myself quite a bit from this post. 2010 has indeed been a year of huge changes for the better. Rekindling the passion by doing instead of just talking. Actively reading books and blogs written by testing veterans, joining the ranks of Miagi-Do, participating in the cost of testing book project, first time as a conference speaker... This years has indeed taught /a lot/ more than I ever imagined and the process is so far from stopping now that I'm (finally) approaching full speed! Thank you for the post, it was a delightful read! It has been an awesome year, Michael, and you have been working on your own skills, and helped to make yourself grow. Thanks for letting me help you with that, and I look forward to your new frontiers. I have more to say about that, hopefully in the form of a blog entry during the next week (or so). Loved this post Michael. After reading this, I can easily see what I have been missing from past couple of years. I can blame personal reasons and other distractions - but honestly there is no reason for not improving continuously. Fortunately I started this process couple of weeks back, started tweeting, following and reading and it helped. I have started participating in week night testing sessions and it's helping a-lot. Thanks once again for this wonderful post and I am sure it will show path to many people like me. Congrats Michael, awesome post and obviously an awesome year. I recognice many parts form my own experience but where I have been merely fumbling around making a few minor improvements you have truly been focusing and taking it to a whole new level. Thanks for the good assistance when I attended the AST BBST course, and for a long line of inspiring posts. May 2011 prove even more spectacular. Congratulations, Michael. Best wishes in 2011. As I said when I met you back in November, your passion radiates and is infectious! This blog is sure to inspire many folks and rekindle their passion for testing. Thanks for sharing all the ways you have chosen to get involved in the testing community. The community has benefited significantly from your efforts. I hope more people will be moved to step up and find ways to contribute. What a lovely post. I remember you taking that BBST Foundation course. I get personal benefit from mentoring but posts like this re-enforce to me why I do it. Its great to see you "taking on" the software testing community and making such a difference. You have had a banner year, Michael! Congratulations on having the wisdom and energy to take advantage of so many opportunities. Thank you also for the many contributions you are making to others through your work. That'd be an amazing story if it were over 5 years, but all in 1 year!!! I wish every person who calls him/herself a tester (or QA or similar) would read this and understand why raising the bar personally and professionally is so rewarding! Thanks for being such an inspiring example. Thank you for a passionate and inspirational story. For actually saying that if you work hard enough, it will pay off in a good way. Really awesome and inspirational post. I first read this post when you wrote it in 2010. It made a big impact. Outstanding stuff. Justin Hunter pointed me to your blog post. What a refreshing read and what an outstanding achievement in just one year. Every one of your sentence conveys a level of passion, which bursts full of joy and love for testing. Keep up your positive attitude, it is most refreshing.